It’s that time of the year when those 1-2 zucchini plants you set out in your home garden are overflowing with vegetables. If you’re like me, you’ve fried squash and zucchini, stuffed some, made some zucchini bread (I’ll share that recipe later), shared some zucchini with friends and you’re looking for new things to try. This recipe was one of my grandmother’s side dishes. I’ve made it a time or two at work and everyone loves it. Even if you don’t have zucchini growing in your yard, run down to Publix and pick some up and give this a try! It’s also a great “brunch” dish because it’s a lot like a quiche. Heat oven to 375F. In a skillet, cook zucchini and onions in butter until tender. Stir in parsley and seasonings and remove from the heat. In a mixing bowl, blend the eggs, mayo, sour cream and cheese, then stir in the sauteed vegetables. Roll out the crescent rolls and line the bottom of a 12×8 baking dish (greased or sprayed with Pam) with the dough. Top dough with Dijon mustard, then pour in the zucchini mixture. Bake uncovered for 18-20 minutes or until center of the casserole has set (to make sure the eggs are cooked). 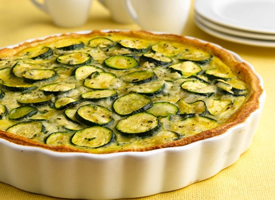 This entry was posted in Vegetable Side and tagged Italian zucchini, zucchini, zucchini casserole, zucchini crescent pie, zucchini pie, zucchini quiche by quarlj01. Bookmark the permalink.